A premium quality world class 5-string banjo that is appreciated for its crisp tone with great highs and distinctive bass response. The Calico is not only beautiful, but it is also exceptionally dynamic with both powerful sound and response providing an excellent tool for all styles of music. The heart of the Deering Calico banjo is the Deering bronze tone-ring, precisely fitted to the three ply maple rim. The Deering -06- tone ring produces a beautiful, balanced overtone spectrum. 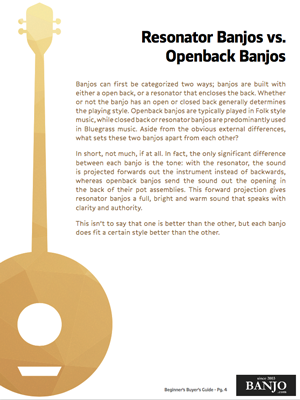 Its weight is ideal for most styles played on the banjo. A softer touch will provide you with as much sustain as you ever want, a sharper attack will produce a distinct pop and accurate note separation. You will notice no dead spots over the entire fingerboard. The beautiful highs and powerful well rounded bass is the result of intense study of alloys and shapes resulting in superb sound. With a brighter tone than mahogany, maple provides a beautiful bass response and great highs. The banjo plays string to string and up the neck at a consistent clarity and excellent volume so it is easily heard amongst a band. Every banjo is carefully setup before shipping saving you from the "some assembly required" hassle. Also know as the 5th string capo, we recommend installing spikes on the 7th & 9th frets. This is a free service we include for all 5-string banjo purchases. Start pickin' the day your banjo arrives. We include: DVD, strap, tuner, and picks. Every banjo shipped to the Continental U.S. / APO includes free USPS Priority Mail shipping. Start improving your playing immediately. Get 7 weeks of video banjo lessons delivered right to your email inbox. Taught by a master banjo instructor. Prior to being shipped, we carefully inspect and test every banjo. If you have any issues with your banjo, call us and and we will help. *We can add these as a free service when you purchase a banjo from us. When you add this banjo to your cart just select that you want the capos. What is this? When you use a standard capo on your banjo fretboard, fretting strings 1 through 4, you’ll need to capo the 5th string separately. The 5th string starts at the 5th fret. If your standard capo is on the 2nd fret, you also need to capo the 5th string two frets higher, at the 7th fret. We recommend installing railroad spike capos on frets 7 and 9 (A and B). We install them on the fretboard just under the 5th string, an idea that was developed and used by Earl Scruggs himself. We use them, and so do most of the professional players we know. When you’re playing, you don’t really notice the spikes because they’re out of the way, but they’re always there when you need them. Simply slide the 5th string under the spike. When you’re done, slide it out. Barry at Banjo.com helped me make a great choice on purchasing a new banjo. He answered my emails and phone calls promptly . After a few conversations I went with his newly designed Bishline Coal Dust . I ordered it and he kept me updated on its progress . It arrived in perfect condition and its even nicer than he described . I will keep Banjo.com at the top of my list for any future purchases and would highly recommend them to others. Thank You again to Barry and his staff. I ordered a Deering Goodtime and received in goodtime! Pardon the pun! The tuner was querky and the included strap in the package wouldn't attach to the banjo without alteration. I emailed Barry and he took care of everything! Great customer service. My order arrived on time to the RIGHT address even though initially it was being sent too my previous address. Thanks guys for helping me out now my customer will be happy and so will I. Sincerely Rick ' Maverick Guitar Repair '. OUTSTANDING CUSTOMER SUPPORT! What great people and what great work. Thank you Banjo.com! The Calico is a very striking banjo. Flamed maple and really nice inlay with a bound peg head. It also has the 06 tone ring and is the perfect banjo for the performer or the collector.